Posted March 9th, 2015 & filed under Competition. Utrecht, February 23, 2015 – ClimateLaunchpad 2015 (formerly known as CleanLaunchpad) is now open for applications. Students, start-ups, entrepreneurs, researchers and employees dreaming of starting their own business are invited to submit their cleantech ideas. All entries are judged on their impact on climate change, their growth potential and on skills and enthusiasm. The most promising entries gain access to Climate-KIC’s Accelerator programme, geared at growing big cleantech ideas into strong businesses. The competition is now open for entries in 24 countries. A two-day business boot camp and a series of focused coaching sessions prepare the participants for the country finals where they will pitch their business plan to a professional jury. The three finalists of each country will enter the European Final in September in the Netherlands. In semi-finals 8 teams will be selected and gain access to Climate-KIC Accelerator, the real-life business school focused on developing and commercialising cleantech start-ups. The overall winner of the European final also receives a cash prize of €10,000, the runner up gets €5,000 and the idea that comes in third place wins €2,500. The competition is open to participants based in Austria, Belgium, Cyprus, Denmark, Estonia, Finland, Germany, Greece, Hungary, Iceland, Ireland, Italy, Latvia, Lithuania, the Netherlands, Norway, Poland, Portugal, Romania, Slovenia, Spain, Sweden, Switzerland and the United Kingdom. Application deadlines per country are available on the ClimateLaunchpad website. 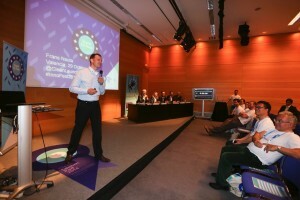 ClimateLaunchpad is a programme by Climate-KIC; the EU’s main climate innovation initiative. It is Europe’s largest public-private innovation partnership focused on mitigating and adapting to climate change. Climate-KIC consists of an international network of companies, academic institutions and the public sector.